The vMotion product team is looking for input on how to improve vMotion. vMotion has proven to be a paradigm shift of datacenter management. Workload mobility is a must-have requirement in today’s datacenter operational model. vMotion handles the majority of workload flawlessly. However, there are some corner cases that introduce some challenges. The vMotion product team is interested in these corner cases, to improve the vMotion architecture bringing workload mobility to all workloads everywhere. It would be very helpful if you can provide us with some more information to make vMotion even better. Thanks! This question pops up regularly on the VMTN forums and reddit. It’s a viable question but the admins who request this feature usually don’t want Maintenance mode to break or any other feature that helps them to manage large scale environments. When you drill down, you discover that they only want to limit the option of a manual vMotion triggered by an administrator. 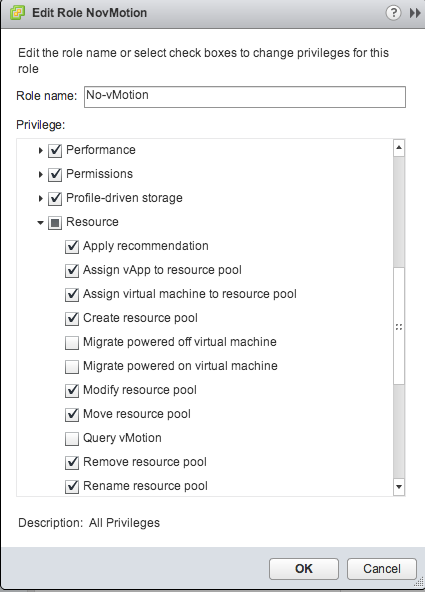 Instead of configuring complex DRS rules, connect the VM to an unique portgroup or use bus sharing configurations, you just have to add an extra permission to the VM. The key is all about context and permission structures. When executing Maintenance mode the move of a virtual machine is done under a different context (System) then when the VM is manually migrated by the administrator. As vCenter honors the most restrictive rule you can still execute a Maintenance mode operation of a host, while being unable to migrate a specific VM. 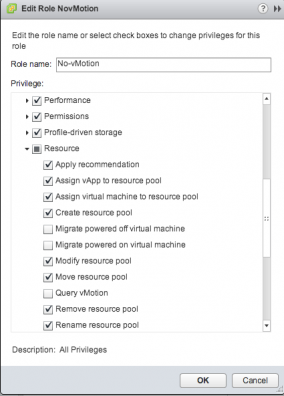 Step 2: Restrict User privilege on VM. 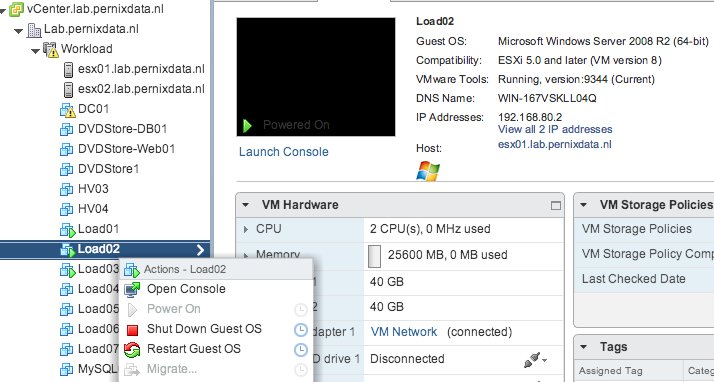 Select “Host and Clusters” or “VMs and Templates” view, the one you feel comfortable with. Click on Add and select the User or Group who you want to restrict. On the right side of the screen in the pulldown menu select the role “No-vMotion” and click on OK. Ensure that the role is applied to This object. FrankD is a member of the vCenterAdmins group which has Administrator privileges propagated through the virtual datacenter and all its children. 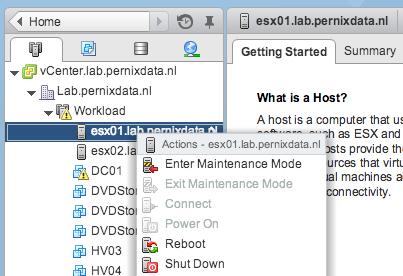 The option Mainentance Mode is still valid for Host ESX01. Click on the option “More Tasks” in the Recent Task window, here you can verify that FrankD is the initiator of the operation Maintenance mode, and System migrated the virtual machine. vSphere 5.1 update 1 release fixes Storage vMotion rename "bug"
vSphere 5.1 update 1 is released today which contains several updates and bug fixes for both ESXi and vCenter Server 5.1. In vCenter Server , when you rename a virtual machine in the vSphere Client, the VMDK disks are not renamed following a successful Storage vMotion task. When you perform a Storage vMotion task for the virtual machine to have its folder and associated files renamed to match the new name, the virtual machine folder name changes, but the virtual machine file names do not change. This issue is resolved in this release. To enable this renaming feature, you need to configure the advanced settings in vCenter Server and set the value of the provisioning.relocate.enableRename parameter to true. 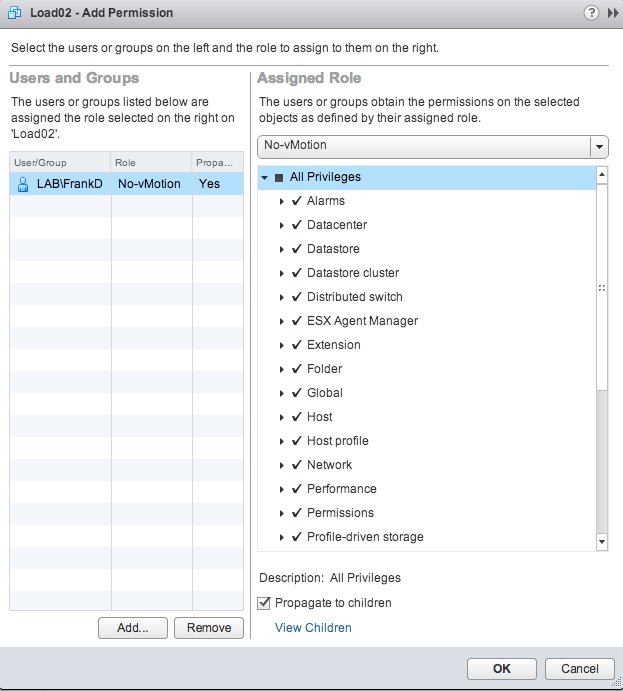 vCloud director 5.1 supports the use of both storage profiles and Storage DRS. One of the coolest features and unfortunately relatively unknown is the ability to live migrate virtual machines between datastore clusters by changing the storage profile in the vCloud director portal. In my lab I’ve set up a provider vDC that contains two compute clusters. Each compute cluster connects to two datastore clusters. Datastore Cluster “vCloud-SDC-Gold” is compatible with the VM storage profile “vCloud-Gold-Storage”, while Datastore Cluster “vCloud-SDC-Silver” is compatible with the VM storage profile “vCloud-Silver-Storage”. When creating a vApp the default storage profile of the organization vDC is applied to the vApp and all its virtual machines. 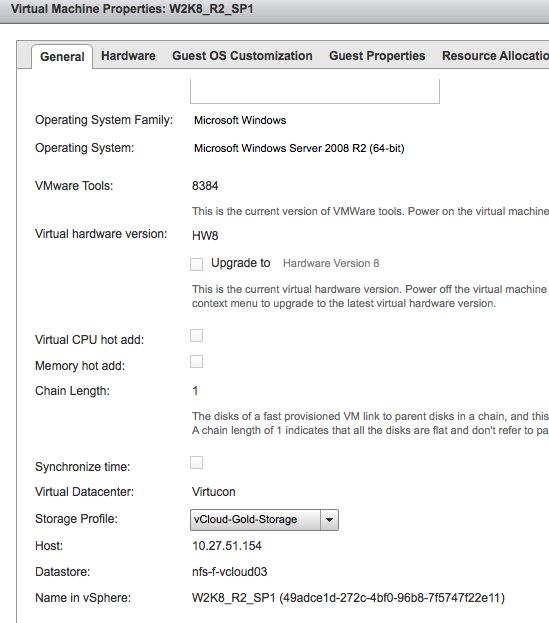 In this case, the VM storage profile Gold is applied to all the virtual machines in the vApp. You can determine which VM Storage Profile is associated with the virtual machine by selecting the properties of the virtual machine in the “My Cloud” tab. Please note that vCloud Director does not show the VM Storage Profile at the vApp level! By selecting the drop-down box, all storage profiles that are associated with the organization vCD are displayed. By selecting the Storage Profile “vCloud-Silver-Storage” vCloud Director determines that the virtual machine is stored on a datastore that is not compatible with the associated storage profile. In other words the current configuration is violating the storage level policy. To correct this violation, vCloud director instructs vSphere to migrate the virtual machine via Storage vMotion to a datastore that is compatible with the VM storage Profile. In this case the datastore cluster “vCloud-DSC-Silver” is selected as the destination. Storage DRS determines the most suitable datastore by using its initial placement algorithm and selects the datastore that has the most amount of free space and the lowest I/O load. To demonstrate the feature, I selected the virtual machine “W2K8_R2-SP1”. The VM storage profile “vCloud-Gold-Storage” is applied and Storage DRS determined that the datastore “nfs-f-vcloud03” of the datastore cluster “vCloud-DSC-Gold” was the most suitable location. By changing the Storage Profile to “vCloud-Silver-Storage” vCloud director instructed vSphere to migrate it to the datastore cluster that is compatible with the newly associated VM storage profile. After the task is complete, vCenter shows that the virtual machine is now stored on datastore “nfs-f-vcloud06” in the datastore cluster “vCloud-DSC-Silver”. The abstraction layer of vCloud Director makes this possible. When changing the storage profile directly on the vSphere layer, nothing happens. vSphere will not migrate the virtual machine to the appropriate datastore cluster that is compatible with the selected VM storage profile. The reason why I was looking into this feature in my lab is due to an conversation with my esteemed colleagues Lee Dilworth and Aidan Dalgleish. We were looking to an alternative scenario for a stretched cluster. By leveraging the elastic vDC feature of vCloud director, a seperate DRS cluster is created in each site. Due to the automatic initial placement engine on the compute level, we needed to find a construct that can provide us a more deterministic method of virtual machine placement. We immediately thought of the VM profile storage feature. Create two datastore clusters, one per site and associate a profile storage based on site name to the respective datastore clusters. When creating the vApp, just select the site-related Storage Profile to place the virtual machine in a specific site. Due to the compatibility check, vCloud Director determines that in order to be compliant with the storage profile it places the virtual machine on the compute cluster in the same site. For example, if you want to place a virtual machine in site 1, select the VM storage Profile “site 1”. vCloud director determines that the virtual machine needs to be stored in datastore cluster “DSC-Site-1”. The compute cluster Site-1 is the only compute cluster connected to the datastore cluster, therefor both the compute and storage configuration of the virtual machine is stored in Site 1. This configuration works perfect if you want to simplify initial placement if you have multiple sites/locations and you always want to keep the virtual machine in the same site. However this solution might not be optimal for a Stretched cluster configuration where failover to another site is necessary. As this feature uses storage vMotion instead of cross-host/datastore vMotion, means that the cluster needs to be connected to both datastore clusters. This question regularly pops up on twitter and the community forums. And yes it works but VMware does not support vMotion interfaces in different subnets. The reason is that this can break functionality in higher-level features that rely on vMotion to work. If you think Routed vMotion (vMotion interfaces in different subnets) is something that should be available in the modern datacenter, please fill out a feature request. The more feature requests we receive; the more priority can be applied to the development process of the feature.